How many bicycles do the Dutch own? As you might have noticed last month I didn’t have any updates of this blog. Busy at work with internal affairs I can’t write about and preparing lectures abroad took a lot of time. And at home I was busy with maintaining the bicycles we own. 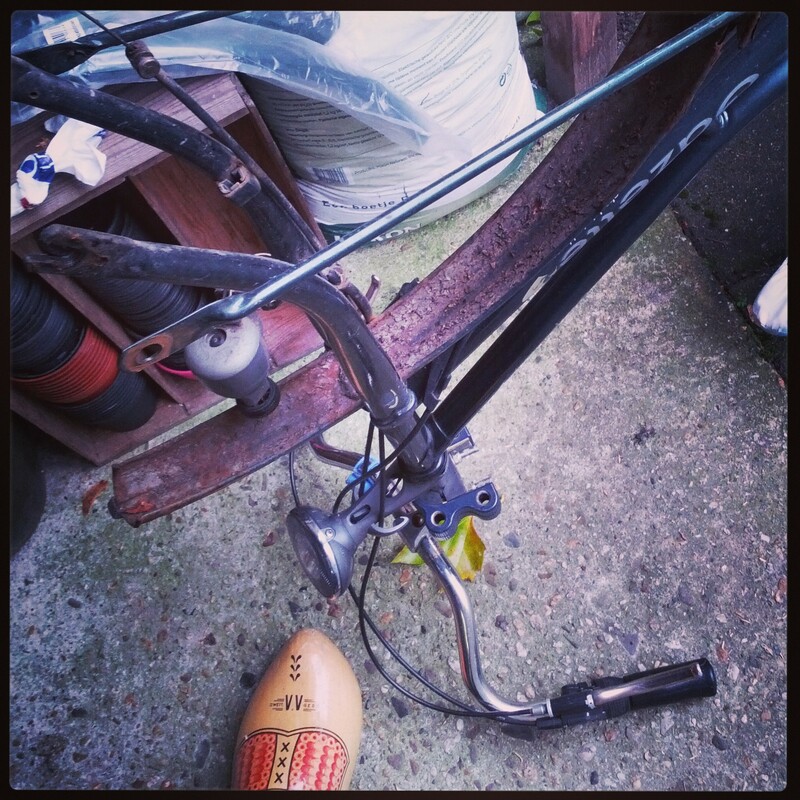 Renewing the mudguards and the chain of a traditional Gazelle bicycle is time-consuming, but when finished it is a pleasure to see everything running smooth. I am happy that not all the bicycles in my bike shed need that much attention. Which brings me to the point that the Dutch have so many bicycles. 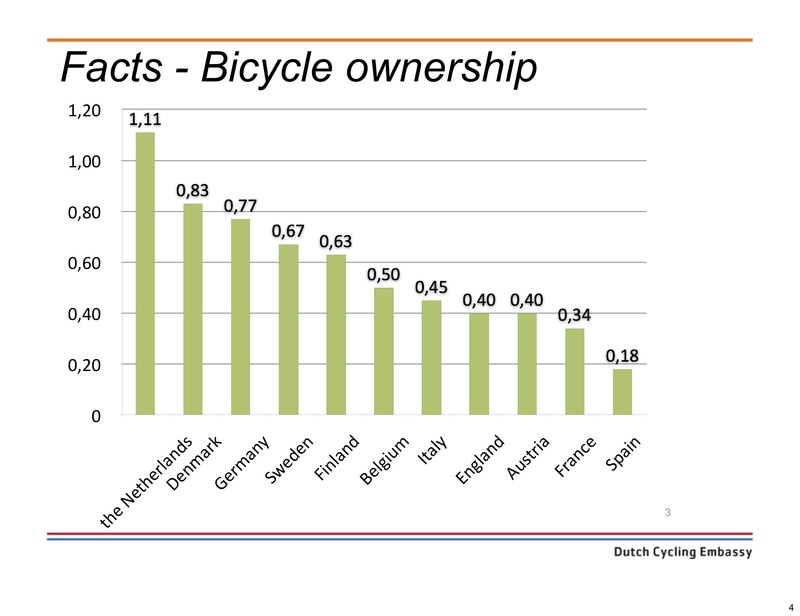 As Dutch bicycle ambassadors we always show the following graph to show that the Dutch own more bicycles per capita than other people in the world. To be honest, I haven’t a clue about the source or the reliability of the presented data. Any suggestion for better data is appreciated. Bicycle ownership per capita per country in Europe. 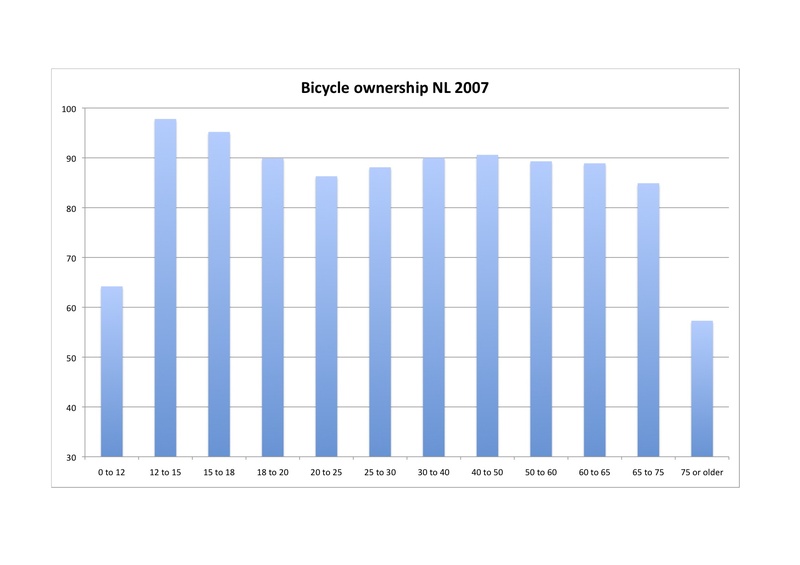 Ownership of bicycles in the Netherlands to age, 2007. Two things cached my eyes. The first thing is that the age between 12 and 15 has the highest rate of bicycle ownership in the Netherlands. This group is depending of a bicycle to go to secondary school. At the age of 16 youngsters are allowed to a licensed ride of a moped, at the age of 17,5 driving a car comes in reach. So it is understandable the younger group has the highest ownership. Another interesting fact is the group between 20 and 30. They have the lowest ownership of the traditional working class cohort. It is interesting to find out if this is only a dip in the 2007 numbers, of some more information can be found. With the data an easy overview can be made. This graph shows that over the years the group of 20-30 has almost the same ownership, but that the 30+group since the mid 80’s has grown, with the biggest relative growth in the 75+ group. But also the groups 60-65 and 65-75 show a remarkable growth during the years. Whatever the exact mechanism is behind this growth is not clear to me, it is likely about the policies to promote cycling to work and the tax benefits to buy a bicycle. I don’t have clear causal relationships, others might have a good explanation. 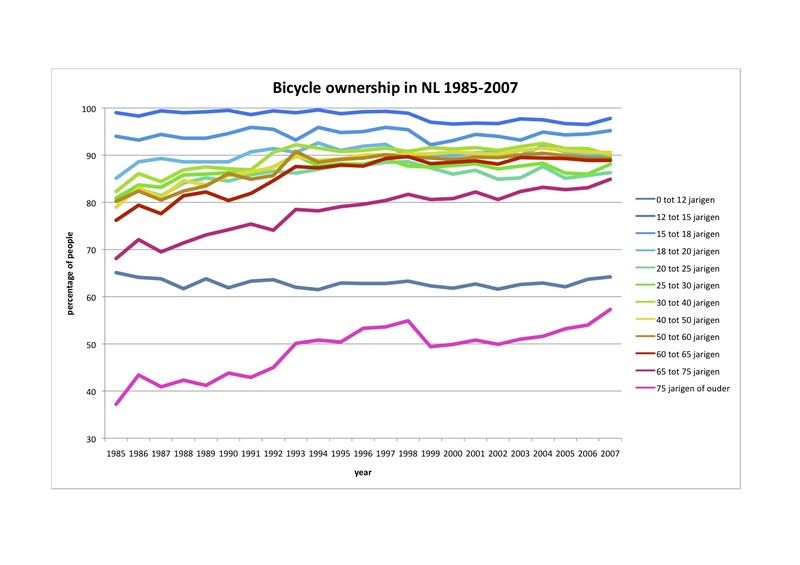 The result counts to me, the growth shows that cycling in the Netherlands is more and more a matter of all ages. Something we have to be proud of. Note that in this data the newest trends of more cycling by young urban hipsters cannot be recognized, the series of data last until 2007. But how about the 1,11? It means that some people might have more than one bicycle. With an easy sample I can prove this assumption. Last year I questioned my Twitter followers how many bicycles and persons belong to their households. The results show that my followers are not the average Dutch people. 52 Followers answered, they have average 2,33 bicycles per captia, so more than double the Dutch average. The highest was a real collectioneur, with 2 persons and 14 bicycles ready to cycle. In that perspective the view in my bike shed is rather modest. 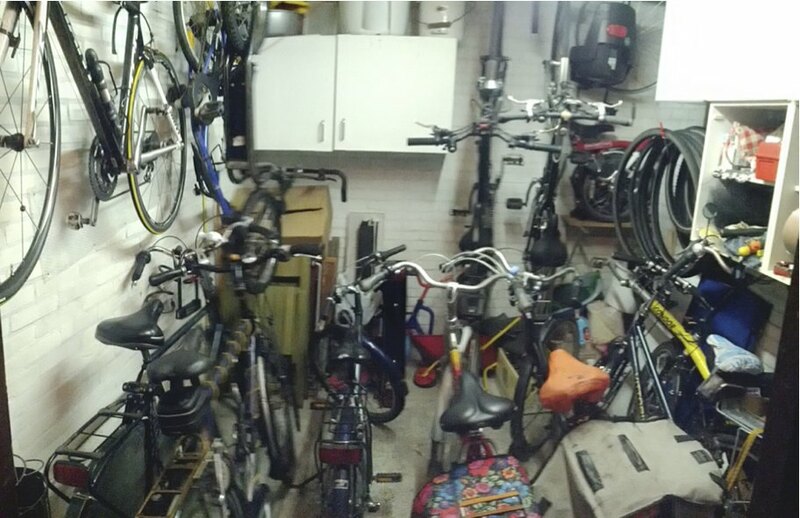 My bike shed contains 11,5 bicycles for 4 people. The bicycles per capita stats are derived from the MON/OVIN data I guess. They ask about the amount of bicycles in the Household as well and the extrapolated number of bicycles is of course easily divided by the size of the population. It is correct that gathering data was done by CBS at MON and OViN. To break down the data to gender (not mentioned in the figures above) and age, it is necessary to ask more than the question I asked my twitter followers. Pingback: The march of bicycle science – Jennifer Dill, Ph.D.